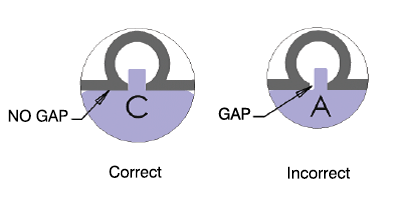 Using the lettered disks, determine the width of the luff groove. Simply insert the lettered studs into the luff groove anywhere along the mast. Select the stud which fits in the luff groove with the least amount of play side-to-side without jamming or sticking. Once you have found the stud size that fits snugly, move the stud up the mast (within the luff groove) as far as you can reach to ensure that the luff groove width is uniform. 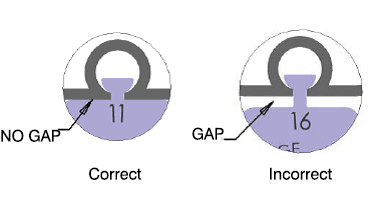 Next, use the numbered disks (11 through 17) to determine the lip thickness of the luff groove. Select the stud which allows the least amount of play foreand-aft. You can slide these numbered studs through the mast gate. Or, you can turn each stud 90°, insert it into the luff groove above or below the mast gate and turn the stud until you find the one that fits snugly. When you have measured you luff groove width and lip thickness, use the table to determine if Tides can cut a track that matches your measurements. Each box with a "✔" indicates that Tides can produce track to fit your mast. SailTrack Systems may be ordered online.